Fill Pak paper packaging void fill is highly effective and durable. It can be scrunched by hand or with our FillPak TT machine to fit the gaps in your parcels, thus securing and cushioning items for transit or storage. The paper fill is a superb shock absorber, easy to store, reusable and biodegradable. It is converted into void fill in just a few moments using the machine, which is light, compact and operated by hand. The 15-inch Kraft brown paper is equally suitable for general packing and void fill purposes, making the whole Fillpak system a cost-effective packaging and paper solution. FillPak paper is quite simply a superb environmentally-friendly brown paper for void fill and packaging. 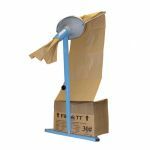 It is made from strong single-ply Kraft paper, which is both flexible and durable, perfect for instant paper void fill. 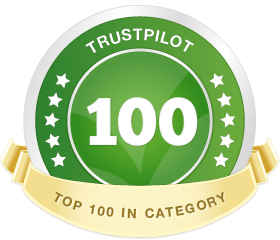 It is ideal for filling those gaps down the side and on top of goods packed in boxes. You can use our handy Fillpak TT machine, feeding in the fill paper and tearing it off as required at the perforation as it forms a star configuration, or simply scrunch it up by hand. The star configuration allows you to use the paper fill to its maximum because it adapts easily to the gaps to be filled. 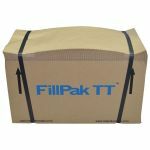 The Fillpak void fill solution is extremely convenient as the paper is easily stored and the machine is light and easy to use – it does not have a motor. The machine, which takes up little space, has a height-adjustable table clamp so it can be moved where needed in a busy packing station. This cost-effective all-in-one paper packaging system saves time and improves productivity.